A fun little romper for Spring! by The Cottage Mama. It includes Sizes 6 Months to 6 Years. 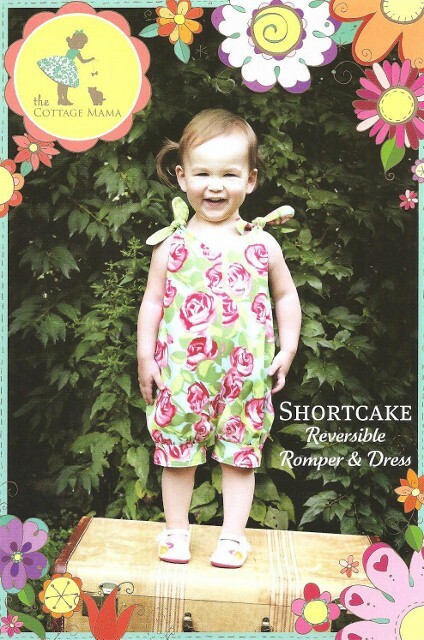 Designer, Lindsay Wilkes, has recently started marketing her cute patterns. 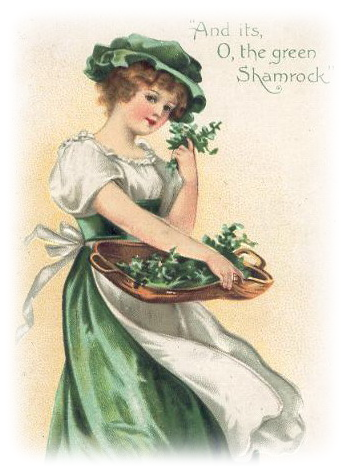 She also has a fun blog, The Cottage Home, filled with scrumptious recipes, tales of being a young mother, and examples of her creative sewing. Her patterns include excellent instructions, complete with photographs of each step of construction. 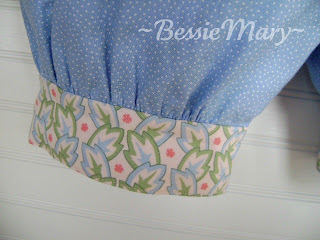 This pattern also included a recipe for Lemon Blueberry Shortcake Muffins! Treetop in pink from an Oliver + S collection for Moda Fabrics. This is a Size 3T. This is a very easy and simple pattern, perfect for beginners, or if you just want to whip up something really, really quickly! There is no hand sewing at all. It is all completed by machine. It probably took me longer to decide on fabrics and trace the pattern, than it did to actually stitch. The romper is completely reversible, making it two outfits in one! Both romper and dress tie at the shoulders. 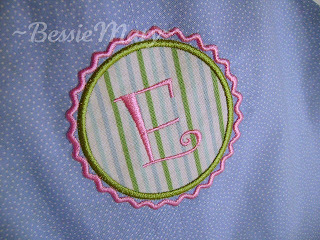 I did add a sweet applique monogram to the blue side. This is the Rick Rack Monogram from DigiStitches. I alternated the fabrics for the leg bands, to add a little more contrast and interest to the finished project. I also applied a lightweight woven fusible interfacing to each leg band piece. I believe this added a little stability and gave a more finished appearance. In all honesty, I thought about adding the interfacing while tracing and preparing the pattern. In my haste to get to the fun part of stitching, I forgot to cut out the interfacing. Again, I decided to try and follow the pattern instructions for this first time use. However, after attaching one leg band, I could tell interfacing would really help. So, my trusty seam ripper was put into action! After a few minutes of cutting and applying interfacing, I was stitching again and more pleased with the outcome. For the dress version, I selected Half Moon Modern Big Dots in Steel by Moda. I used a solid pink broadcloth for the lining. 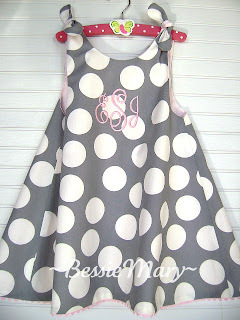 While the dress is still reversible, I made it mostly to be worn with the dots as the outer fabric. The hem is edged with pink rick rack. The dress is Size 4T. I really love the more full swing style of this little dress -- perfect for running, skipping and twirling! 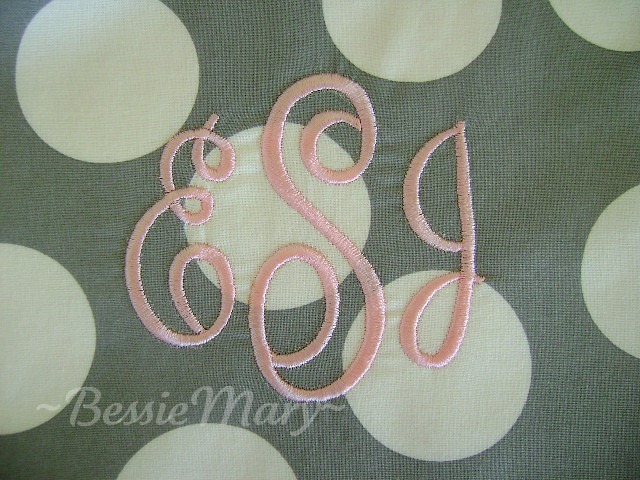 I also monogrammed the dress in pale pink to match the rick rack and lining. The font is Empire, one of my all-time favorites, from Embroidery Arts. I am cleaning up my sewing room to prepare for a few more projects. First, I am off to pamper myself with a much needed manicure! All fabric and patterns available at BessieMary. Your garments are lovely, the dress is very sweet, but it would be perfect for an older girl. Oh I wish Miss C. would still wear dresses! I can see that all your fighting with your embroidery machine paid off...the monograms are perfect. Lovely projects. I can see you are thinking about warmer weather and sleeveless dresses. I can't wait! Adorable!!! 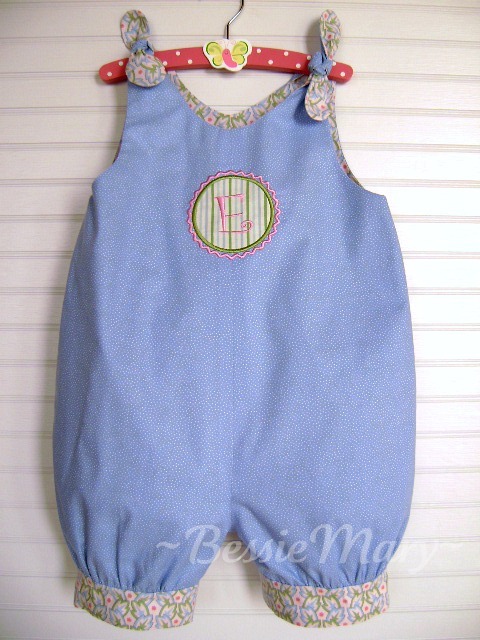 I wish I had a little girl to sew for? Oh my gosh! They are both adorable! You are so talented. I know one little girl who is going to be very excited. Thank you so much, Aunt Jan.
WAY CUTE! 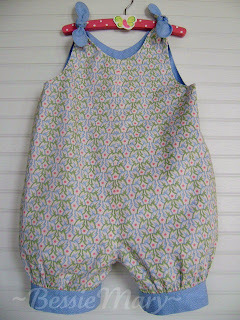 What an adorable pattern, and the fabric is seriously awesome. I really like the look of the romper and the dress, but can't find the pattern/s! Any idea?